TRS Containers has the most diverse container and chassis inventory in the US. We are not limited to dry freight containers. TRS offers new and used ISO Refrigeration containers for Climate Control to preserve perishable products from food to hazmat chemicals. 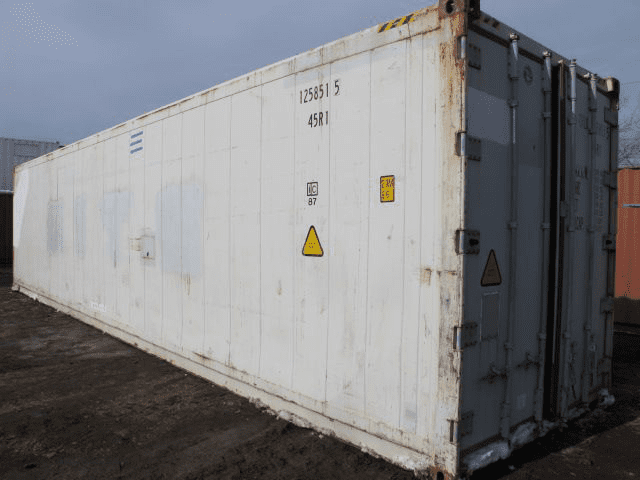 In addition, we stock the structurally sound watertight lockable containers whose reefer units are weak or no longer functioning. Those containers are a more economical form of an ultra-insulated shelter that can be altered to accept your own heat or a/c device. TRS refers to them as Former Refrigeration Containers or Insulated Boxes. They are sold at a discount. 220 / 440V, 50 Hz, 30 amp, 3-phase Commercial Refrigeration Unit. 4 inches of foam insulation poured into the floor, ceiling, walls and doors. Air tight, weatherproof, and rodent proof. Aluminum or muffler grade steel smooth skins. An instant affordable cold room for seasonal events. Durable and easy to clean interior stainless-steel liner. 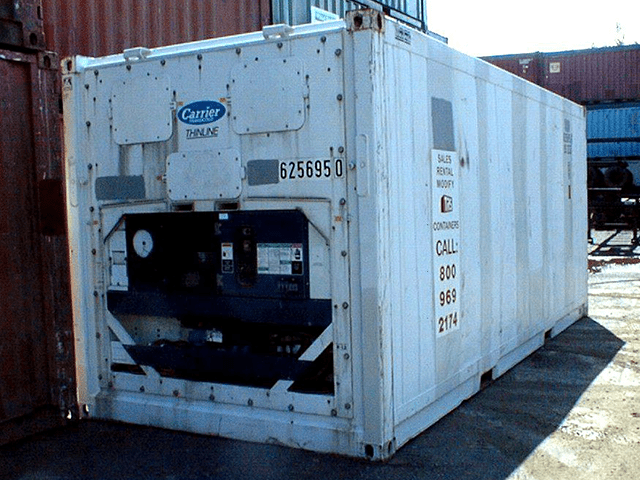 Each container is tested by a certified refrigeration mechanic prior to sale or rent. Electric only refrigeration units: Carrier, Mitsubishi, Daiken, ThermoKing. Export ready condition or ground storage for a supermarket or nursery. Fits on a standard chassis for transport and dock height access. Floor is designed to allow air to circulate under cargo for climate control. Heavy duty door gaskets to prevent air leakage. Mylar / PVC strip curtains available to contain the cold air. New units are equipped with light and diamond plate kickplates. 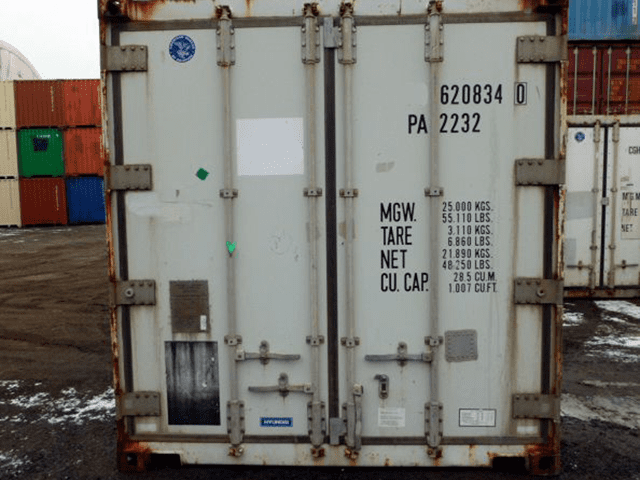 New and Used containers available. Sell and rent diesel generator sets to power the refrigeration containers. Transformers available to convert the 440/460 Volt units into 220 American current. 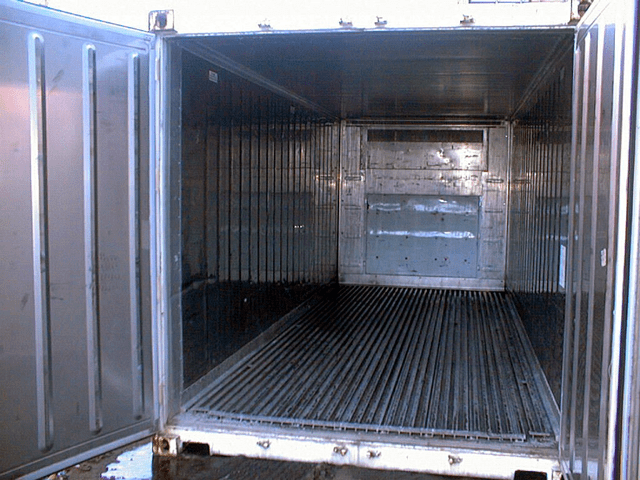 TRS offers fabrication options to expand the functionality of a Reefer. Add a personnel door and lights for a safe climate-controlled workroom. Add LED lighting and it functions as a hydroponic farm. Can be outfitted with a domestic roof mount RV a/c heat unit for climate control. Install an oven and it functions as a kiln. 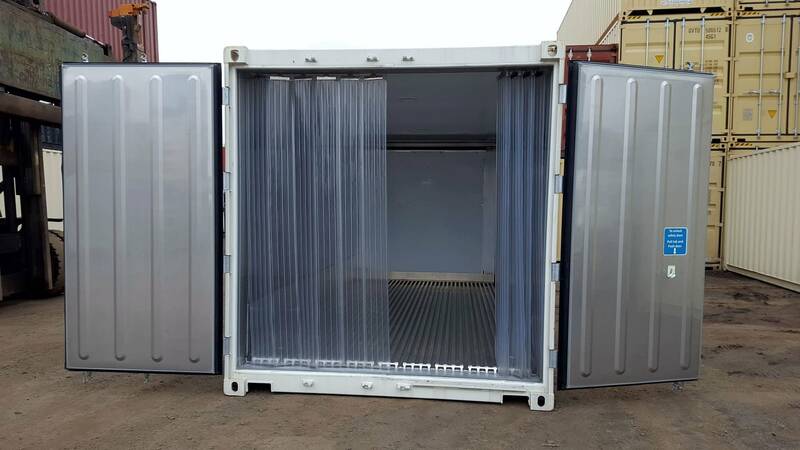 Insulated containers have the commercial refrigeration unit still mounted on the front. The containers are watertight, structurally sound and lockable. TRS sells and rents Insulated units when the reefer unit is beyond repair or unreliable for service. Used insulated containers are referred to as Former Reefers. Used units are in stock for sale or rent. 15 Kw, 460 volt, 60 Hz, 3-phase power output. Clip-on nose mount units attach to the container. Constructed of aluminum panels and doors with steel frame. Diesel Gensets are necessary to run a reefer when it cannot be hard wired to power. Diesel gensets are suitable for an event, power outage, and startup construction job. Electric reefers (Carrier, Mitsubishi, Daiken, ThermoKing) use gensets as an alternate power source. Fuel tank of 120 gallon capacity. Gensets are manufactured to meet international shipping line criteria. Invaluable at events, emergency power outages, construction jobs. Safety stop controls for low oil pressure, high water temperature..
TRS sells and rents diesel generators that clip to the front end of a container to power the unit. TRS sells and rents diesel gensets to power reefers when mounted on a chassis getting load. TRS sells running refrigeration containers with diesel gensets when they cannot be hired wired. TRS stocks running reefers for emergency situations or well-planned climate-controlled events. Weight approximately 1675 lbs, less the fuel. Don’t see what you need contact RenaS@trscontainers.com for Nationwide availability and pricing. Interested in Modifications, contact FrankS@trscontainers.com Special Projects Manager.